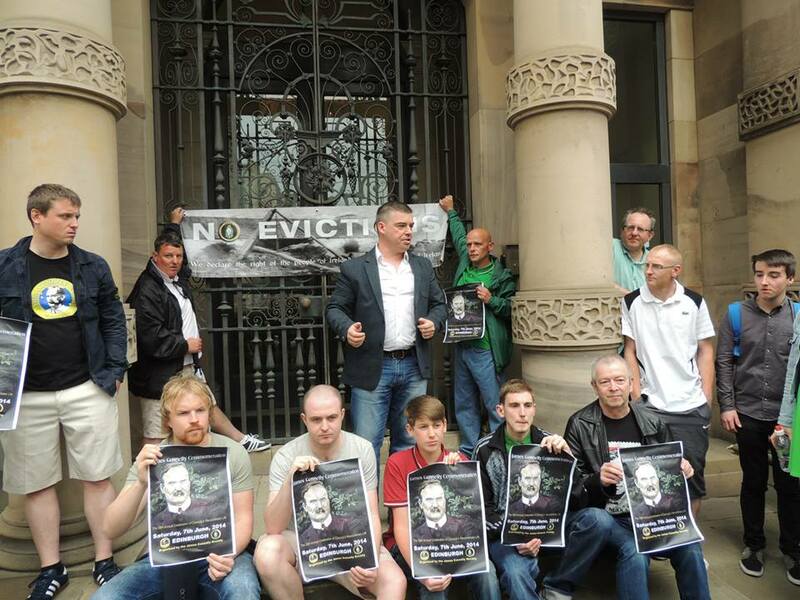 JCS anti-eviction picket at Bank of Scotland HQ in Edinburgh. 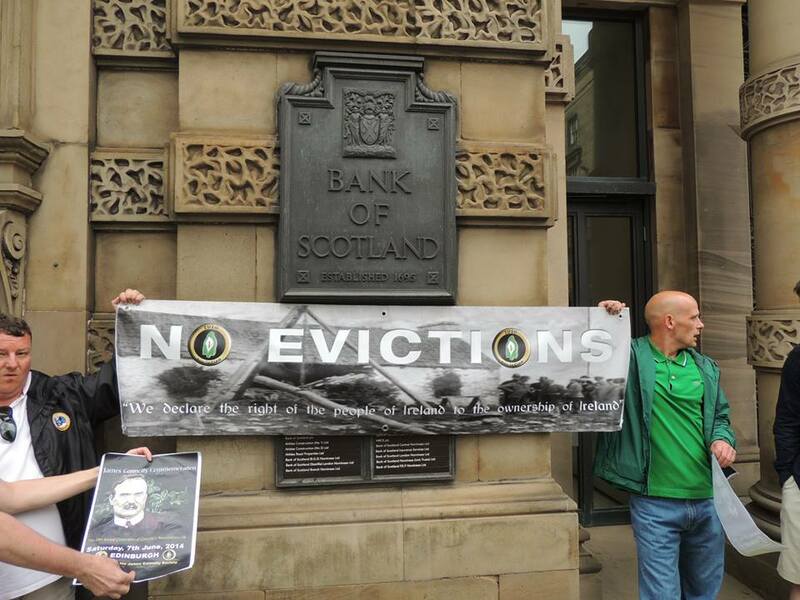 At the end of yesterday’s James Connolly commemoration in Edinburgh Jim Slaven, Chairman of the James Connolly Society, urged people to march on the Bank of Scotland Headquarters in solidarity with the 200,000 families facing eviction in Ireland. Bank of Scotland have played a scandalous role in Ireland property bubble, subsequent collapse and now the move to evict hundreds of thousands of people. 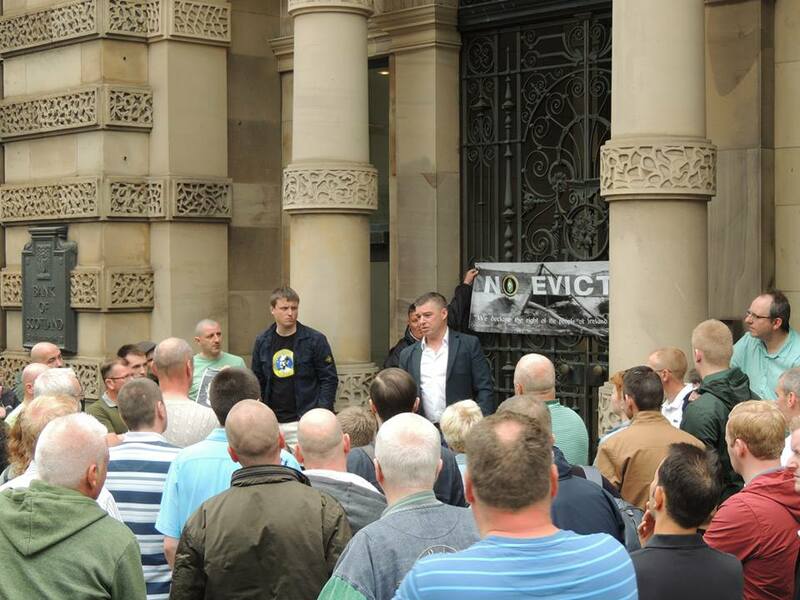 Neil Armstrong of Lay Litigation Ireland addresses JCS anti-eviction picket at Bank Of Scotland HQ on the Mound in Edinburgh. Below is an article originally published on Awaken Longford blog outlining Bank of Scotland’s role. In this offering we will examine the experience we as a Country were afforded by Halifax / Bank of Scotland Ireland (BOSI), I shall lay out in simple terms, how BOSI came to be in Ireland, how they acted in their short sojourn in Ireland, how they left Ireland and how they were treated byGovernment, the Courts and the Central Bank of Ireland / Financial Regulator. I will highlight important milestones in red as it is important to join the dots…. at the end I shall make the comparision between BOSI and the average Irish Consumer who availed of BOSI’s services and product offerings, you can then draw your own conclusions and of course, I am always interested in hearing your comments. Bank of Scotland Ireland was wholly owned subsidiary of Bank of Scotland Plc which in turn, is a subsidiary of Lloyds Banking Group in the UK. Bank of Scotland entered the Irish market in 1999 by purchasing Equity Bank Ltd which was founded in Ireland in 1965. Bank of Scotland entered the Irish market by acquiring and existing Bank, buying a share of the Irish Financial products market, so to speak. There is an accepted view in certain circles, namely the Mortgage/Insurance Brokerage industry, that it was in fact, the Brokers who enticed Bank of Scotland to come to Ireland. Either way, “buying market share” would become the modus operandi of Bank of Scotland, rather that putting in the effort to win over the Irish Consumer with a portfolio of solid, proven financial products, which is accepted as true, level playing field, Competition. So, having established a presence in Ireland, the next step was to evaluate the Irish scene and sectors the Bank wished to target, this turned out to be the Industrial / SME sector and directly the average consumer for both savings and home mortgages. Bank of Scotland Plc (BOS), re-branded its existing Irish operations in 2000 as Bank of Scotland Ireland. Bank of Scotland’s presence was now established and operating separately as a wholly owned subsidiary of Bank of Scotland Plc. In 2001, Bank of Scotland Ireland (BOSI) purchased ICC Bank plc from the Irish State. This purchase of ICC Bank was a carefully thought out (??) move to purchase a direct access point to the Irish Industrial Sector, ICC Bank was one of two banks set up many years previous, the sister Bank being ACC Bank (later bought by Danske Bank). ICC was formerly known as the Industrial Credit Corporation and ACC was known as the Agricultural Credit Corporation. ICC Bank was set up in 1933 by Sean Lemass and was modelled on the already established ACC Bank, in an effort to stimulate investment in the Industrial sector. BOS plc operated the Irish mortgage business directly from Edinburgh until 2004 when BOSI took over and moved that previous business to Dublin. In 2005 BOSI made a bold expansionist move by acquiring the ESB’s ShopElectric chain of retail outletswhich almost instantly gave it a 46 branch, high street presence all over Ireland. This aquisition cost BOSI €120 Million without the cost of refitting any location or retraining any staff. It was still seen as a good deal against Danske Banks takeover of NIB (National Irish Bank) which cost €500 Million. This was the very epicentre of the era in Irish Banking through the Tiger years when market share was bought and sold to the highest bidder, BOSI and Danske Bank were locked in battle as the newcomers to the Irish market while the indigenous Banks seemed to sit by an watch as their market share was attacked without mercy. They had two choices, sit out and forfeit market share or engage with the foreign monoliths like Lloyds Banking Group, Danske Bank and RBS Group, they choose to engage. This expansion made BOSI the fourth largest Bank operating in Ireland, all in the space of 6 short years,and the 6 most prolific years of the Celtic Tiger era. In August 2006 BOSI re-branded its retail banking as Halifax and retained BOSI name for its industrial/commercial customers. Bank of Scotland / Halifax consistently, operated an aggressive, expansionist business model, leading the way and setting the pace over the entire Irish Banking sector from the moment it entered the Irish Market. In 2007, Halifax announced the launch of a personal current account which offered an unprecedented 10% interest on credit balances up to €2000 to customers lodging €1500 or more per month. Halifax also introduced the first Visa Debit card to the Irish Market which eventually led to the demise of the previously dominant Laser Debit Card, mainly because of the Laser cards restricted usability outside Ireland. It is widely accepted that Bank of Scotland initiated huge amounts of competition in the Irish Mortgage market, they drove down application criteria, they also compressed margins and they brought the “tracker” mortgage to Ireland. The Tracker Mortgage is by its very nature and design a low margin product and again its introduction by BOSI was another overt attempt to grab even further market share, the result in reality was, although advantageous to borrowers, to force the other banks to follow suit and act in a way which cannot be regarded as prudent and which was destined to have only one outcome, a squeeze on the providers until the obvious failure of some or all occurred, which it did. This strategy would prove to be the undoing of BOSI and a monumental backfire. BOSI consistently laid down the marker to all other Irish Banks in relation to both deposit products and home mortgage products. “Bank of Scotland (Ireland) Limited has informed the Central Bank and Financial Regulator that its shareholder, Lloyds Banking Group, has decided to exit the Irish market. The bank had shaken up the Irish mortgage market from 1999. Bank of Scotland entered the Irish market in late 1999 through the broker channel and with competitive mortgage deals that turned the Irish banking sector on its head. At the time, they undercut their Irish rivals with variable rate mortgage deals that were about 1% cheaper than domestic bank offers. So BOSI came in with a bang and left with an even bigger bang, leaving the Irish home mortgage market in tatters and over the medium term would result in 1,600 job losses in Ireland. So who was the person who oversaw BOSI during its meteoric rise and catastrophic decline in Ireland and what happened to him? Really!…nothing to do with the demise of the Bank? HOW DID GOVERNMENT AND THE REGULATORS VIEW THIS DEPARTURE? Firstly it is important to note that in the year 2010 BOSI operated as normal, or as normal as possible but did not file any accounts for 2010 or any part of 2010. Bank of Scotland Ireland and Bank of Scotland Plc availed of EU Cross Border Merger Regulations to transfer the business of BOSI completely to BOS Plc. This transfer was rubberstamped by both the Irish High Court and a Scottish Court of Sessions which provided for the accounts of BOSI to be SEALED on both sides of the Irish Sea, in effect hiding the true, factual condition of BOSI at the time of the Cross Border Merger. The losses of BOSI, which total in the Billions, also transferred to BOS Plc and Lloyds Banking Group who in turn can utilise those losses against tax liabilities in the UK. Authority (PRAI), formerly known as the Land Registry, came to a cosy accommodation with BOS Plc whereby, the view of the PRAI in relation to the registered holders of first legal charges over property which rested with BOSI, was to accept that BOS Plc had now “stepped into the shoes”of BOSI and therefore no requirement existed for the thousand’s of Irish Mortgages to be re-registered in BOS Plc’s name. 1. The PRAI simply did not want the workload of re-registering this Mortgages. 2. BOS Plc did not want the registration expense of such re-registration of Mortgages, in short a massive write off of fee’s by the Irish Government at a time when so many Irish people are pinned to their collar with austerity budgets and the Troika living in the basement. To this day, what this means is, that every Receiver appointed by, or Repossession Order granted to, Bank of Scotland Plc is carried out while Bank of Scotland Plc is not the registered owner of a Charge in the PRAI. Bank of Scotland Ireland brings the “tracker” mortgage to Ireland. This is a firm that was brought to Ireland by brokers. Bank of Scotland (Ireland) Limited has informed the Central Bank and Financial Regulator that its shareholder, Lloyds Banking Group, has decided to exit the Irish market. The bank had shaken up the Irish mortgage market from 1999. Bank of Scotland (Ireland) announced today it will no longer offer banking activities in Ireland from the end of December 2010. Bank of Scotland (Ireland) leaves the Irish home mortgage market in tatters and over the medium term would result in 1,600 job losses in Ireland. Mark Duffy was BOSI Chief Executive Officer for the entire period and it is reported he departed in 2009 with a multi million euro payout. Bank of Scotland (Ireland) did not file any accounts for 2010 or any part of 2010, in Ireland. The Irish Loan Book of BOSI was sold the a BOS Plc controlled company for the princely sum of £1.00. The Irish Property Registration Authority (PRAI), formerly known as the Land Registry, came to a cosy accommodation with BOS Plc whereby, the view of the PRAI in relation to the registered holders of first legal charges over property which rested with BOSI, was to accept that BOS Plc had now “stepped into the shoes” of BOSI and therefore no requirement existed for the thousand’s of Irish Mortgages to be re-registered in BOS Plc’s name. BOS Plc did not want the registration expense of such re-registration of Mortgages, in short a massive write off of fee’s by the Irish Government. That’s it….all that remains is for BOS Plc to mop up the Irish property it allegedly loaned funds for and realise a return, rub it’s hands together and not even look over its shoulder at the carnage left behind in Ireland. Full sure, in the knowledge that the Irish Government and the Irish Courts are 100% behind their endeavours. 1. Would you say that BOSI failed in their “Professional Diligence”? 2. Would you say that the actions of BOSI “materially distorted the economic behaviour of the Average Irish Consumer”? 3. How do you compare the actions of BOSI and the actions of the average Irish Consumer/Retirement Property Investor? IF YOU ANSWER THE FIRST TWO QUESTIONS ABOVE WITH A “YES”, PLEASE WRITE A COMMENT AND SAY WHY….THIS IS IMPORTANT! THE ANSWER TO THE THIRD QUESTION IS JUST YOUR OPINION BUT GREATLY VALUED BY THISBLOG….